Tai-chi is held in esteem for promoting both mental and physical well being. It is regarded as having a preventative effect on illness and thought to increase longevity. Scientific studies have found that tai-chi can lower blood pressure, improve balance and improve circulation. The concept of "chi" ("qi") is deeply embedded throughout Chinese culture. It is commonly believed that "chi" is an energy that drives the universe and all living things, that "chi" exists in our bodies in the breath and the blood and is absorbed into the body from the universe. It is the central underlying principle in traditional Chinese medicine. "Chi" sensations can be felt and extraordinary exhibitions witnessed yet its existence is unproven by science and etherial definitions do little to help us understand the phenomena. 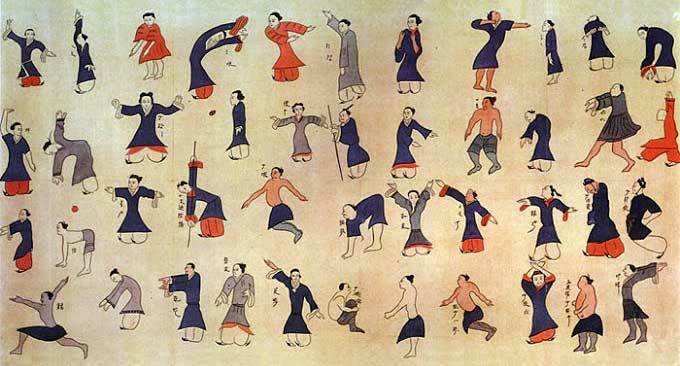 Early references to "chi" in Chinese literature and art relate to a strong healthy body through movement, breath control and visualisation techniques. These references can be found in the works of Zhuangzi and prints of ancient daoyin postures excavated from the Mawangdui tombs (below) both of which pre-date the Qin dynasty. It is insightful to compare these with common elements of training techniques from current Asian development systems that have a long lineage such as tai-chi, qigongs ("chi" exercises) and even yoga. These all involve flowing, intention led movement coordinated with the breath; relaxed stretching and contracting without locking joints; visualisation techniques; a calm, focused meditative awareness; and a balanced, substantial, gravity related connection with the ground. There are a number of interrelated components to this training. A significant element is the development of the body’s connective tissues which is effected through relaxed stretching and contraction while minimising muscle usage. This tissue cannot be built up in the same way as muscle but it can be conditioned. While tendons and ligaments are relatively easily accessed, the outermost fascial layer (the superficial fascia), which is an epidermal layer of the skin, is more difficult. In tai-chi and the internal arts, a technique known as 'reverse breathing' or 'Taoist breathing' is used to assist the "tan-tien" to connect with this tissue to affect movement (this tissue is also targeted in acupuncture while iron shirt qigong training develops the tissue into a resilient outer shell). Visualisation techniques are used to access aspects of the body which are not under our conscious control. There are a multitude of body self-regulating mechanisms activated through the involuntary muscle system via the subconscious mind, some of which can be trained to be under conscious control through imagination. Visualisation can be coordinated with the breath to develop pressure and may increase blood flow/oxygen/"chi" to targeted areas. Putting all these things together in a coordinated synergistic manner takes a considerable amount of understanding and practice. All the truly knowledgeable Chinese teachers of tai-chi use the word "chi" in the context of movement. As such it may be helpful for the tai-chi practitioner to think of "chi" is as a bridge between intention ("yi") and movement or action, with the "chi" propagating the movement through the bodies connective tissues in a spiralling wave which continually cycles outward from the "tan-tien" while 'opening' and back again during 'closing'; ‘where the mind goes the "chi" follows’. Breath development in tai-chi is a gradual process. It is important to breathe naturally at all times and not to force the breath either in the movements or in one’s overall development. The body naturally regulates the correct rate of respiration. Typically we only use about a third of our lung capacity in everyday activities and habitually this tends to be the top third of the lungs, only drawing in air deeper at times of greater physical demand. In tai-chi we gradually re-train the breath such that the lower parts of the lungs are employed at all times (using abdominal muscles rather than chest muscles) even when taking shallow breaths. This 'abdominal breathing' is referred to as breathing into the "tan-tien" and is said to facilitate the production of "chi". The breath is naturally coordinated with the movements. Normally beginners are taught to inhale while the body expands and exhale during contraction. However focusing on the breath while practicing the complex and varied movements of a tai-chi form can be deleterious and it is generally better for beginners to only focus on the breath during specific points, such as at the beginning during preparation and in the opening movement. The breath is then trained through "chi kung" ("qi-gong") neigong or 'silk reeling' exercises that synchronise the breath with the movement. Over time the breath will then naturally harmonise with the movements in the form. More advanced students are taught a more complex synchronisation in conjunction with 'reverse breathing'. Normally, but not exclusively, this means inhaling during an upward movement or when yielding/storing and exhaling when moving downward or during an envisaged application of power. When done correctly this enables the required connectivity between the "tan-tien" and the fascia in order to express 'body as one unit' and to involve all the soft tissue cells in the body in the contraction and expansion that goes with 'opening' and 'closing' movements. A principle objective of tai-chi and all other internal martial arts is the development of "peng-jin" ('ward-off' energy) which is more commonly referred to as "neijing" (internal strength) in the other internal arts. "Peng-jin" can be defined as a physical manifestation of "chi". It is associated more with the bones and collagen based connective tissue of the body than with the muscles, though muscles inevitably do play a part in maintaining the optimal body shape and developing the movement from the legs and midriff. Modern anatomical understanding has proven that the collagen based fascial tissues are able to store and release kinetic energy. This goes a long way to explaining fa-jin, the legendary explosive energy release for which tai-chi is famous. "Peng-jin" requires a mind led skill which is achieved by using the intention ("yi" 意) to align the body in a manner which creates a pathway from any given point of contact with an opponent to the ground via the tan-tien. In movement the route of this pathway continually changes so the mind must constantly be involved. Furthermore the body structure must remain completely relaxed to avoid the pathway segmenting; at which point local muscle strength takes over and the pathway will no longer function effectively. This energy vector can then be manipulated by two mechanisms that develop core strength. The first is the ability to rotate the tan-tien on any axis and the second is the ability to open and close any joint or combination of joints by connecting the whole body through the midriff. Understanding internal strength improves ones capacity to relax while upright. Relaxation facilitates internal strength. Correct understanding of the nature of "peng-jin" and a good training method are essential requirements for the development of the eight tai-chi energies or 'moving jins'. When correctly practiced the relaxed body feels connected and strong and over time develops an elastic quality. Fundamental to it all is the ability to maintain a loose pathway by remaining completely relaxed yet supported. To do this the body must be trained to support a load (initially its own load) through its structure and connective tissue without any muscles tensing and with the musculature of the upper body playing a purely supportive role in maintaining optimum body shape. In order to remain relaxed the muscles must be able to do this effortlessly. Paradoxically this requires considerable muscle re-training and development throughout the entire body; especially in the legs which power the movement. Relaxation while standing with the arms somewhat extended or while executing a movement slowly is extremely difficult to achieve. Because our normal posture is so ingrained, we may not be aware of areas of tension and even when a teacher points them out they are difficult to eliminate. Sometimes when a correction to our posture is made a whole sequence of tensions can fall away. Particular attention should be given to the shoulders, lower vertebrae and hips. The slow movements of the foundation forms in tai-chi promote calmness and allow the mind to focus on the details of the mechanics of the movements. 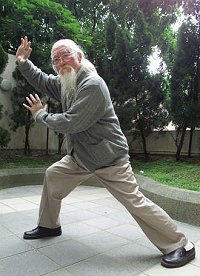 Tai-chi movements are controlled from the centre of the body ("tan-tien") which can also be the focal point of meditation techniques. As the mind directs the movements and the movements are controlled by the "tan tien", the slow movements of tai-chi naturally have a meditative quality. These attributes have given tai-chi an excellent reputation for imparting good health and longevity. For this reason the practice of tai-chi has become more popular for its health benefits than for the attainment of fighting skills, though the route is essentially the same if all of the potential benefits are to be fully realised. It stands to reason that any gain is very much dependent on what is practiced, how well it is done, how often and for how long. Attending a class once a week will not make a significant difference. Daily practice is highly recommended and the more you do the greater the benefit. It takes considerable time, effort and a good understanding to attain all the benefits that can be derived from tai-chi but some health benefits come about quite quickly. These are the combined result of whole body exercise, relaxation, balance, posture and calming the mind; resulting in improved circulation, reduced tension, better concentration and increased awareness. Quality daily practice develops core body strength and gradually develops the body’s collagen based connective tissues, strengthening tendons, ligaments and fasciae. Extensive quality practice can strengthen the internal organs (which are surrounded by fascia) and is said to increase bone density. If done from an early age it can also lead to some special abilities.